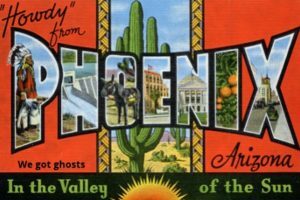 On this week’s episode, Harley and Brett have to brave the heat to explore a beautiful desert city, Phoenix, AZ. Phoenix is a thriving desert metropolis, the fifth most populous city in the country and is steeped in Native history. We have a great talk with Katie Mullaly and J. Patrick Ohlde about The Museum of Natural History in Phoenix. Katie and Patrick are prolific Paranormal Authors and Investigators. What is Sensory Replication and how does it apply to the field of the paranormal? Does the museum come to life at night? Why would a demon be stuck in a nightstand? Who were the Hohokam people? Where did they go? Should we do a full show? If you are tired of chasing ghosts through priceless historical artifacts, may we suggest Curious Nature? This is a science and natural history emporium with an emphasis on the strange and fantastical….ohhh and you can buy creepy taxidermy stuff. The Top 5 may contain the secret to enlightenment or we could just be Rick-Rollin’ you.